WASHINGTON — It’s a well-known Christmas tradition for volunteers to place wreaths at the grave sites at Arlington National Cemetery, but a similar tradition that honors our fallen also takes place around Memorial Day in Arlington and 18 cemeteries across the country. 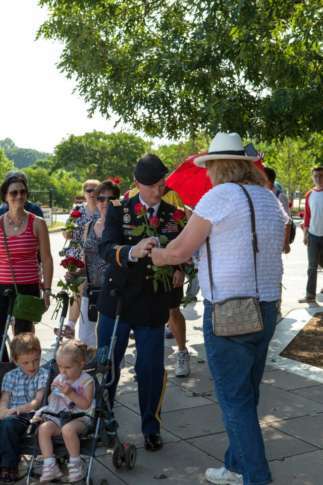 The Memorial Day Flowers Foundation is organizing its seventh year commemorating servicemen and women by holding an event where the public can place roses at grave sites and hand out flowers to families in Section 60 — where fallen service members from the Iraq and Afghanistan Wars are buried. “We gave out 10,000 roses that first year at Memorial Day, and it’s grown from there to 60,000 the next year and last year, about 140,000,” said Ramiro Penaherrera, one of the organizers behind the Memorial Day Flowers event. The foundation works with the Veterans Affairs’ National Cemetery Administration, and they’re expecting 200,000 flowers total throughout national and veterans cemeteries across the country. The flowers are from Colombia, Ecuador and California, and this year they will also be receiving roses from Ethiopia. Penaherrera lives in Ecuador where he has a flower farm, but he was born, raised and educated in D.C. He has five family members at Arlington, “so Arlington has always played special role, a huge role in our family’s life,” he said. And he sees how special Arlington Cemetery is for others. Families of fallen service members are very appreciative of the solemn event, said Penaherrera, who was in Section 60 at Arlington during the first year of the event. Then he realized what she meant. “I was giving her flowers for her son who was buried in Section 60,” Penaherrera said, pausing, overcome with emotion. He said that experience was so emotional; he has delegated the task of handing out flowers there to someone else. Penaherrera has seen many of the volunteers return year after year. Jack Bacarra, an 11-year-old Boy Scout, has volunteered for this event for more than half of his life. He spends his Memorial Days at Arlington Cemetery. “I feel very reverent ‘cause I’m honoring the people who served our country,” said Bacarra.